To put that in context, this is equal to or larger than the domestic revenues of established listed heavyweights such as Dabur, Emami, Marico, and Godrej Consumer. Patanjali, run by a popular yoga guru with a strong following, is now India's fastest-growing consumer products brand. A new force in the land. The rise of Patanjali has been nothing short of meteoric, posing a challenge to the companies that have dominated the consumer scene for years. The company, which started as a small pharmacy, has expanded to sell the full range of consumer categories, from edible oils, biscuits, and noodles to toothpaste, hair and skin care products, and groceries. Back in FY12 revenue was INR4.5bn and this is expected to reach nearly INR50bn by the end of FY16 (Business Today, December 2015). To put that in context, this is equal to or larger than the domestic revenues of established listed heavyweights such as Dabur, Emami, Marico, and Godrej Consumer. Patanjali, run by a popular yoga guru with a strong following, is now India's fastest-growing consumer products brand. Patanjali's solid momentum is likely to continue. We recently met Patanjali's management and visited the company's food park in Haridwar in northern India. We also talked to wholesale distributors and retailers and got feedback from consumers, who like the healthy, high-quality low-cost approach. We believe the company's business model is rewriting the rules of consumer marketing in India. A broader retail and distribution network (two thirds of revenue comes from northern India). Investor concern. 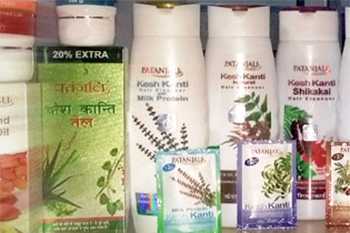 The success of Patanjali has raised investor concerns about the impact on established consumer names. Opinions are divided. This report assesses the threat to different companies in a range of product categories in terms of value, revenue exposure and product differentiation. It also runs a scenario analysis and examines how these companies might respond. We cut target prices and estimates. Our analysis shows that the threat is real, and we have changed our forecasts accordingly, but maintain our ratings. For Dabur (Hold), which we think is most at risk, we cut our earnings forecasts by c7% for FY18e and lower our long-term growth estimates and reduce our DCF-based target price to INR260 from INR310. We lower earnings growth estimates for Britannia (Buy) by c4% for FY18e, and cut our DCF-based TP to INR3,300 from INR3,600. For Nestle (Hold), we lower CY17e earnings by c3% and lower our DCF-based TP to INR6,000 from INR6,400. Colgate (Buy) is also feeling the heat but much is already priced in following the sharp correction in its stock price. Among staples, HUL and Emami remain our preferred stocks: HUL is structurally strongest and Emami should benefit from the rise of Ayurveda.